Discussion in 'Cigars' started by caudio51, Feb 2, 2007.
redneck_toy, CVAC085, Glassman and 2 others like this. redneck_toy, CVAC085, VeLoRoK and 3 others like this. 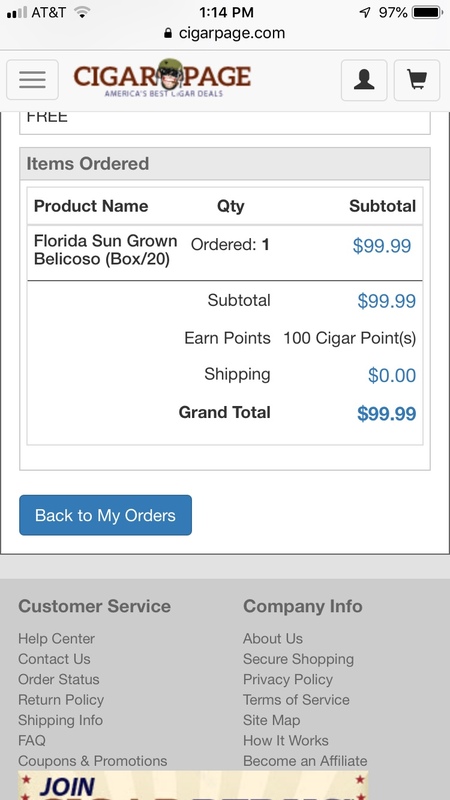 https://www.cigarpage.com/boutique-...outique Tenpackalypse + astounding free bonus. CVAC085, TLee73, Drexell and 1 other person like this. https://www.cigarpage.com/boutique-brand-savings.html?trk_msg=1TRPJCC90OT4129QU330UJGL2O&trk_contact=HJOM5A476JJDFIODSRJ0R371EC&trk_sid=3P3R0T1BE0LCIFIH82BL3G68LG&utm_source=Listrak&utm_medium=Email&utm_term=Boutique tenskis up to 76% off&utm_campaign=Boutique Tenpackalypse + astounding free bonus. Thompson Cigar has RP Vintage ‘90 robustos at 20 for 59.95 plus a cutter. If you buy 40, shipping is free. Don’t forget ebates. OleVaSmoker and mpomario like this. Picked up two boxes of the Norteno corona extra. Thanks! CVAC085, gurgalunas and Jody like this. I did 3 boxes of the belicoso. If that deal comes up again I'll get the coronas too. Thanks for the post. gurgalunas and redneck_toy like this. they ran it around black Friday timeframe too. About a month back they had them for $10 more. I thought they were a good deal then and I picked up a box then. I see this running maybe one or two more times until the old stock is out and replaced with new stock of the new packaging. Drew Estates did the same thing when they had to rename the natural to larutan. Sent from The Department of Arrested Development using an elevated sense of self worth. welder572 and mjones9630 like this. What’s happened to all the deals? Is it this FDA thing? I thought winter was the time to stack em deep for cheap, but I thought last summer had way better and more frequent deals. mjones9630, voyager and Tyler86 like this. Found my birthday box. These are usually way too pricey for me but they are one of my favorite DE offerings. I’ve never seen them this cheap. Tempted to buy another. Glassman, mjones9630, Tyler86 and 3 others like this. Those aren't the same as the original, and are not really very good IMO. Glassman and cwant like this. Gotcha. I guess the originals are no more?